" G]randly ambitious... another masterpiece... this genre includes some of the greatest novels of our time, from Pynchon's V. to David Foster Wallace s Infinite Jest. That's the troupe Larsen has decided to join, and I Am Radar is a dazzling performance." The moment just before Radar Radmanovic is born, all of the hospital's electricity mysteriously fails. The delivery takes place in total darkness. Lights back on, the staff sees a healthy baby boy with pitch-black skin born to the stunned white parents. No one understands the uncanny electrical event or the unexpected skin color. A childbirth is an explosion, the ancient physician says by way of explanation. Some shrapnel is inevitable, isn t it? 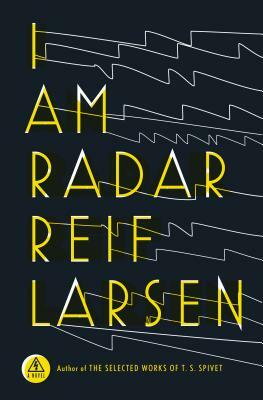 A kaleidoscopic novel both heartbreaking and dazzling, Reif Larsen s I Am Radar begins with Radar's perplexing birth but rapidly explodes outward, carrying readers across the globe and throughout history, as well as to unknown regions where radio waves and subatomic particles dance to their own design. Spanning this extraordinary range with grace and empathy, humor and courage, I Am Radar is the vessel where a century of conflict and art unite in a mesmerizing narrative whole. Deep in arctic Norway, a cadre of Norwegian schoolteachers is imprisoned during the Second World War. Founding a radical secret society that will hover on the margins of recorded history for decades to come, these schoolteachers steal radioactive material from a hidden Nazi nuclear reactor and use it to stage a surreal art performance on a frozen coastline. This strange society appears again in the aftermath of Cambodia's murderous Khmer Rouge regime, when another secret performance takes place but goes horrifically wrong. Echoes of this disaster can be heard during the Yugoslavian wars, when an avant-garde puppeteer finds himself trapped inside Belgrade while his brother serves in the genocidal militia that attacks Srebrenica. Decades later, in the war-torn Congo, a disfigured literature professor assembles the largest library in the world even as the country around him collapses. All of these stories are linked by Radar now a gifted radio operator living in the New Jersey Meadowlands who struggles with love, a set of hapless parents, and a terrible medical affliction that he has only just begun to comprehend. As I Am Radar accelerates toward its unforgettable conclusion, these divergent strands slowly begin to converge, revealing that beneath our apparent differences, unseen harmonies secretly unite our lives. Drawing on the furthest reaches of quantum physics, forgotten history, and mind-bending art, Larsen's I Am Radar is a triumph of storytelling at its most primal, elegant, and epic: a breathtaking journey through humanity's darkest hours only to arrive at a place of shocking wonder and redemption. "Larsen's is an extraordinarily lush and verdant imagination, blooming wildly on the borders of the absurd and the riotous, the surreal and the ordinary Quite unlike any novel] I ve read in a long time. One doesn t consume it; one enters it, as part of a literary enactment Brilliant The effort is well-rewarded: It is both maddening and marvelous I can t wait to see what he pulls off next." Reif Larsen's first novel, The Selected Works of T. S. Spivet, was a New York Times bestseller and has been translated into twenty-seven languages. A Montana Honor book, The Selected Works of T. S. Spivet was a finalist for the IndieBound Award, was short-listed for the Guardian First Book Award and the James Tait Black Memorial Prize, and is currently being released as a film in France and the United States.